1) (L-R) Wisdom Lane Middle School Principal John Avena with his teammates, eighth-graders Olivia Manning, Gabby Stanley, Ryan Downing, Anthony Failla and Bryan Basta. 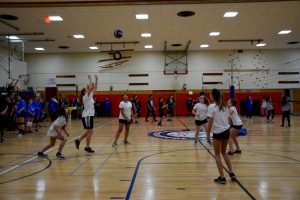 2) Wisdom Lane Middle School students and staff participated in Ro Daly Teacher-Student Volleyball Tournament to raise money for rare cancer research in honor of a former teacher Rosemary Daly. 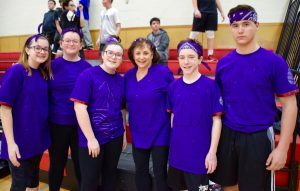 3) Members of the “Z Wildcats”: (L-R) Eighth-graders Ava Banfich, Mackenzie Quinn, Caleigh Bradley, teacher Elaine Zeller, seventh-grader Joey Toscano and eighth-grader Jack Pendergrass. 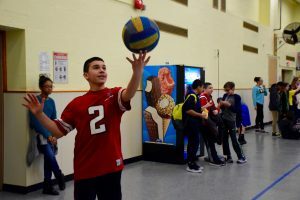 4) Eighth-grader Joe Yassa served for his team.